The Cooper Cobra Radial GT tire is somewhat similar to the BFGoodrich TA model in that they both are popular among owners of older high performance muscle cars. That said, it still makes a good choice for current generation performance models as well. Cooper tires provides for both standard and low profile tread designs, and the tire features above average traction on dry roads. Treadwear is good and the tire is not as noisy as you might expect from a performance tire. Traction and handling on wet roads is about average, as it is in winter conditions. The Cooper Cobra GT tire ranges in price from around $70 for a 13″ series, to upwards of $190 for a 17″ series model. 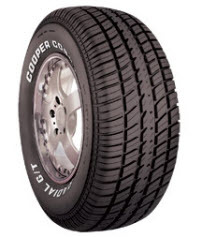 Who Is The Cooper Radial GT Tire For? As mentioned above, Cooper tires has designed the Cobra GT tire for owners of classic muscle cars who are seeking that distinctive look and feel for their vehicles. Cooper stands behind the Cobra Radial GT with a 50,000 mile treadwear guarantee.